The Wyoming Cowboys have picked up not only their 10th verbal commitment of the 2016 recruiting class but they have also now landed their 4th out of Oklahoma. The Cowboys picked up 4 commitments from the Sooner State in the 2015 class. Running back coach Mike Bath continues to come up huge on the recruiting trail. Idabel, Oklahoma wide receiver K.J. Wells joins Mustang quarterback Chandler Garrett, Hollis offensive guard Jace Webb and Ada linebacker Shiloh Windsor so far in this class from Oklahoma. He will also be the second Wyoming player to be on roster from McCurtain County joining freshman linebacker Jaylon Watson (Broken Bow). The 6’4″, 185-pound 2* athlete has played both wide receiver and quarterback in high school. He is considered by many one of the top 10 prospects in all of Oklahoma. He picked the Cowboys over offers from Oklahoma State, TCU, Houston, New Mexico, Sam Houston State, UMass and UTEP. 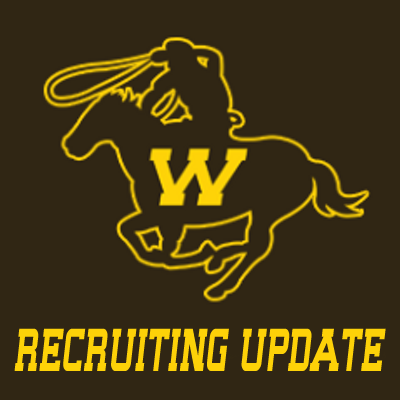 Wells was offered by Wyoming on May 29th and visited the Cowboys this weekend for the Nevada victory. On the reason why he picked the Cowboys over the other suitors? “I picked Wyoming because I wanted to go far away from home, I love how the whole state loves Wyoming and also the coaches are really cool,” said Wells. The number of Oklahoma prospects committed or on roster didn’t go unnoticed by Wells. “I love seeing some Oklahoma faces at Wyoming, it kind of makes me feel like at home,” said the Idabel star.